Our second card with a pop-up feature. 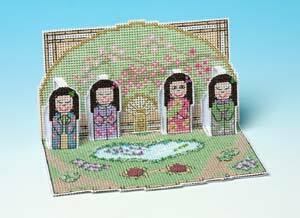 Four colourful dolls stand in a garden before a pretty fan, worked with a spray of almond blossom. This card stands 8 cms high and is decorated with beads and gold thread.